CCI offers Maxi-Mags that have clean-burning propellants for maximum velocities and they utilize sure-fire priming technology. 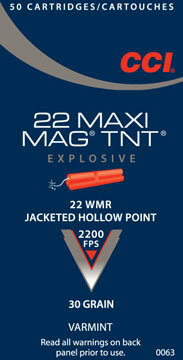 So you don't need forensic evidence to prove that CCI varmint loads are explosive on impact. When you put the crosshairs on your target and pull the trigger, you'll witness the impressive terminal performance of these specialized loads.